This page is an Information Page for participants about the Rules and Rewards for our Master Cleanse Group Cleanse. Please check that page for details on our Quarterly Cleanses and our Individual Cleanses. The Group Cleanse has 3 Prize levels. The Sharing Rewards will give you an extra entry into the draws for each point you receive. Each point is a little a raffle ticket. The more points, the more tickets. $Priceless Value – Lifetime access to the Cleanse Masters Club at iMasterCleanse.com which includes access to all the premium content we've ever created. 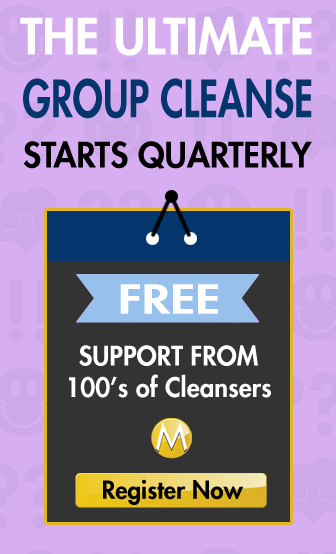 $47 Value – 1 Month Membership to Cleanse Masters, which includes a Copy of the Books such as “Zero To Master Cleanser” and “Master Cleanse ME” and other Premium Content and exclusive access. Registration is always open for the Group Cleanse, but to qualify for prizes in the Quarterly Group Cleanse Experience, you will need to start and stop during the timeframe of each particular Group Cleanse. Also, you don't have to register to follow along and comment. Registration was only for the prizes. Posts must be made on TheMasterCleanse.org website, not on Facebook. Contest Duration: The Group Cleanse starts on Fridays with the Ease-In, and Ends with the last day of the Ease-Out, a Saturday, almost 2 weeks later. Eligibility: In order to be eligible for prizing, you must be 18 years of age and live in a location where contests of this nature are not prohibited. Any individuals (including but not limited to employees, consultants, independent contractors, and interns) who have, within the past six months, performed services for TheMasterCleanse.org, Mike Olaski, Emjayoh Productions, OneWebsite Solutions or any organizations responsible for sponsoring, fulfilling, administering, advertising or promoting the contest or supplying the prize, and/or their respective parent, subsidiary, affiliated and successor companies, and immediate family and household members of such individuals, are eligible to enter or play. “Immediate family members” shall mean parents, stepparents, children, stepchildren, siblings, stepsiblings, or spouses. “Household members” shall mean people who share the same residence at least three months in one calendar year. How to enter: Visit the “Group Cleanse” page. Complete the sign up form & and start sharing with your friends. There is no other requirement to enter. Prize winners will be notified via the email you used to enter the contest and will receive directions on how to claim the prize. How to win: To be eligible for the Grand Prize, you must have commented EVERY DAY, on EVERY TOPIC for 100 Words. Prize winners will be selected in from all qualified entries once the Group Cleanse has completed. The Grand Prize winner will be announced on the first Monday following the completion of the Group Cleanse. In the event that the original Grand Prize winner does not meet Official Rules or eligibility requirements, or he/she or parent or legal guardian forfeits the Grand Prize, we will award prize to first alternate. Process will continue until Grand Prize is awarded. All entries must be received on or before the first day of the Lemonade Diet. to be eligible for the Grand Prize. Decision of the winner is final. Prize winners will be notified via the email you used to enter the contest and will receive directions on how to claim the prize. Prize winners must meet all eligibility requirements. By entering, each contestant agrees to be bound by the rules. TheMasterCleanse.org, its promotional agents and sweepstakes co-sponsors are not responsible for illegible, lost, delayed or misdirected mail, errors in faxes or shipments, website errors or downtime, technical errors, busy phone signals, or incomplete entries. Prizing: Visit the “Prizes” page for information on all the prizes available to be won. All Prizes are non-transferable. However, TheMasterCleanse.org reserves the right to substitute similar prizes of equal or greater value in the event the above prize is unavailable for any reason. Individual, parent or legal guardian of winner is solely responsible for all applicable federal, state and local taxes with respect to entire prize. Tax documents may be required to be completed prior to prizes being awarded. Winner or Parent or legal guardian of Grand Prize winner must sign an Affidavit of Eligibility, Release and Indemnification Form (“the Form”) that : a) releases, indemnifyies and holds harmless TheMasterCleanse.org or its parent, affiliated, subsidiary and successor companies, and its respective officers, directors, employees, agents, and representatives, advertising agencies and promotional sponsors (collectively the “Release”) from and against any and all harm, expense, liability or injury that may be sustained relating to or arising from participation in the sweepstakes or acceptance or use of the prize; and b) authorizes the Releasee to use the winners' names, likenesses, photographs, voices and biographical data for any purpose, in any media, unless prohibited by law. Prize will not be released until TheMasterCleanse.org receives all required documents. Failure of Grand Prize winner to return the Forms within the required timeframe will result in automatic forfeiture of any prizes and all such prizes shall be awarded to an alternate winner. In the event of a prize forfeiture, the winner or parent or legal guardian of the winner forfeiting prize will sign a Prize Forfeit Form and return to TheMasterCleanse.org within ten (10) days of receiving the Form. The Grand Prize (OneWebsite.ca Website Installation) must be used before the beginning of the next Scheduled Group Cleanse (roughly 3 months). Unforeseen Events: All sponsors reserve the right to change this sweepstakes at its sole discretion at any time that we become aware of any circumstances or occurrence which would materially affect the sweepstakes security or fairness.We reserve the right to announce any sweepstakes rules changes via the “Official Rules” page. TheMasterCleanse.org is not responsible for the inability of the winner to accept the prize for any reason. If you haven't yet, go ahead and register for the Group Cleanse to get our “Guided Cleanse Experience” email sequence timed to correspond with your registration and the important days as the come up during our scheduled group cleanses. This is my first time doing the cleans I started yesturday. So far the salt water flush was horrible. Today it wasn’t so bad because I put the salt in about 4 oz of water chug it then drank a bunch of water shortly after. What’s the difference though of a laxative pill compared to a hearbal laxative. I like the idea of being part of a group but I already started my cleanse and don’t want to put it off even for a moment more. I have done the cleanse before, way back in the day before all this wonderful support was available. I think I would have liked being enrolled into a chance to win prizes but I think I would prefer to buy the books before the end of my fast and already have a blog and website. So I will just come and share in the experience with others as this in itself is a part of being successful. I have been part of many programs of self change and literature and a support network have been valuable tools for me in the past. I appreciate what Mike has done here. Thank you Mike!! To be eligible to win do I have to write 100 words on each of the 5 topics and click and post on each link separately or do I 100 words total and touch on every topic? It’s 100 words on each topic, each day. Yes, click through to each topic and leave a comment. You should have at least 65 comments at the end. my garden is in for it this weekend too. i will show no mercy. love this maxi on you. i'm so in love with maxi dresses and skirts right now. you are so lucky to find so many. they are rather hard to come by here. love that you are wearing you great grartmodhens jewelry. that is so awesome. have fun tonight. oh and i cannot believe you slept through the white stripes. omg, you must have been plastered! I am on a cycle 2 of a ten day master cleanse, my first 10 I lost a total of 17 pounds. I took a 6 day break, and decided I felt so good and other than day 2 & 3 which I had a horrible headache, I had a pretty great experience.Being an emotional eater this has given me a break in my attachment of eating mindlessly. My goal is to get rid of all this excess and let it and all my bad habits go away so I can enjoy my life. For many years I have struggled with trying to loose even a pound. I am now older and the weight just kept coming. When you reach a point when carrying around this weight of an extra person, and work hard and on my feet all day, walking jogging etc. was impossible my body was just too tired! Now I have just completed day 4 of my second cycle and 5 more lbs down!! SO EXCITED TO MY FUTURE ACTIVE LIFE!! I will probably take another break and do another cycle in August! Thank you for this website after reading the book I wanted to do it , but it was reading all the FAQ’s that convinced me that this was for me! !